If you have an appliance repair company, then you must be familiar with the struggles of finding new customers. You might still be getting referrals from your satisfied customers. However, most people will just run to Google and make a quick search. They will use keywords such as ‘best appliance repair services in (their state or town)’. The company that shows up in the first place of Google, Bing, or Yahoo result pages is the one they will click on. This is exactly why you need appliance repair services SEO. Are you looking for a professional appliance repair website that will produce sales leads? Call us! Chicago Website Design SEO Company is a professional SEO company that has expansive experience working with appliance repair companies. We have helped many companies achieve high search engine rankings and we have proof. Apart from other businesses, our own website is highly ranked for our keywords. We have a plan that has been created over the years and when implemented, it works towards solid results. First, we research your target market and go through your website content. The main aim of the research is to make sure we understand your target audience and your market space in general. Our experts will also have a look at the competitors that outrank you for a better SEO plan. The collected information is used to create an SEO plan that will help your business move up the ranks. The only way your business website will yield results is if it is visible. Visibility is high on the first search engine result page. 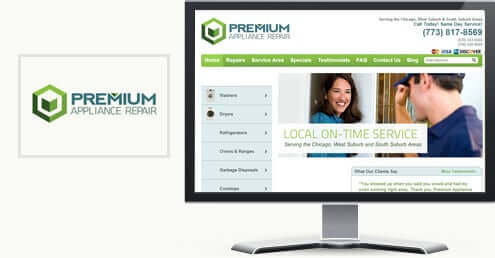 Search for your appliance repair business combined with your city or state. If you do not see your business on the first page, you need serious Appliance repair company SEO. The reason other companies outrank yours is probably because they are using better SEO. If you are running a business that targets a city or a town you might be lucky. We have worked with local and international companies. While international companies have to wait for up to 12 months to feel the SEO results, local businesses do not have to wait that long. This is because the competitors might not be using strong SEO. With our professional SEO for appliance repair services, your website will be at the top of local searches within a reasonable time. Being at the top of search engine result pages comes with multiple benefits. Apart from being the website of choice for a big percentage of searchers, you will be a trusted site. The increase in traffic is one of the main benefits. Our experts will make sure that the traffic converts to customers. To be sure that conversion will happen; we work towards attracting qualified traffic. We aim our SEO strategies at attracting people interested in your appliance repair services. Chicago Website Design SEO Company is dedicated to providing high-quality appliance repair services SEO and marketing. Call us today for the best appliance repair company SEO services.